It has Honeydew Melon, it has the banana and two more healthy delicious ingredients — honey and lemon juice. 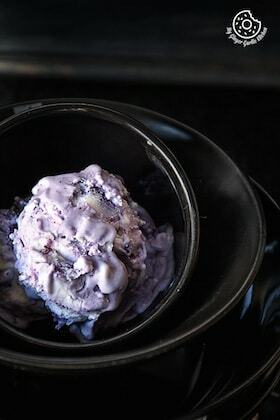 And these 4 ingredients make it a vegan, egg-free, dairy-free, gluten-free and paleo ice cream. 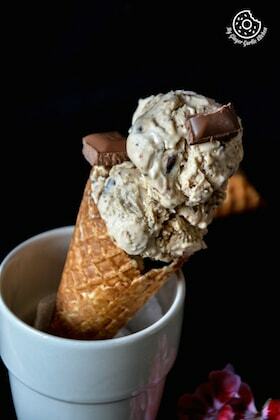 The end result is a creamy, refreshing, sweet ice-cream! It’s good for the body and good for the soul. Let’s enjoy summer till its end: Summer is almost ending at most of the areas around the globe. If I don’t count those couple of days when the temperature was touching 25°C, there has not been many summer looking days. I can even count the number of hot days on my fingers. Adoria’s excitement for her kindergarten: I already wrote about Adoria’s summer break, which is over as of today, and her kindergarten is open again. For her, the summer break is over, meaning that the summer is over. I am very happy to see that she was super thrilled to meet her friends. I so much love her for this sweet gesture and excitement to go to kindergarten even after a month break. Unlike her, I never pleased my parents because I never was so keen to start my school after the long summer break. My childhood: I have always wished for more and more holidays! 😉 Maybe this is because my school started at 7:30 in the morning, and I had to wake up early every day. I have never been an early riser and I am still not the one who loves to wake up early. So summer was my favorite time: Summer breaks were the time when I could sleep for long hours in the mornings. A child inside me still doesn’t want to wake up early. I can work till late night and that doesn’t bother me, but I still haven’t learned waking up early. Sleep has something to do with my love for the weekend: I have seen many people who can wake up at any time in the morning. I know many of you do it. And I salute you, awesome people! However, I also envy you because you are doing something which I always wanted to do, but still couldn’t. And now you know why I LOVE my weekends so that I can sleep as long as I want. Easy ice cream: These days Adoria’s favorite fruits are watermelon and honey melon. And her favorite dessert is ice-cream. I made this ice cream 3 times during her summer breaks and she loved this pretty much every time! The end result was a creamy, refreshing, sweet ice-cream! Hard (or sometimes easy) work always pays off. 4 ingredients make a nICE Cream: As the name suggests, it has Honeydew Melon, it has the banana and two more healthy delicious ingredients — honey and lemon juice. 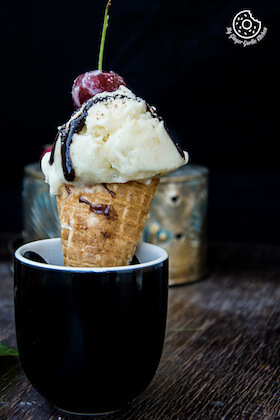 And these 4 ingredients make it a vegan, egg-free, dairy-free, gluten-free and paleo ice cream. 1. Put chopped melon and banana in an air-tight container and freeze them overnight. 2. Add frozen banana and frozen melon pieces to a food processor and blend until smooth. 3. Scoop in an ice cream cone or bowl. 4. Drizzle with chocolate sauce, sprinkle ground almonds and top with cherries.